Visit Silicon Mountain and enter this code to save $150 on your order of a server. See site for details. Buy your online memory from Silicon Mountain and you can get free shipping when you spend $40+. Click link to start shopping now! Spend $200 or more at SMMDirect and you can get a free 2GB flash drive for free when you use this code at checkout. Click link. 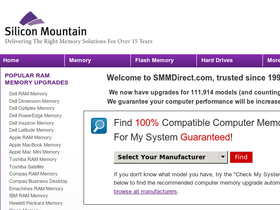 Shop at Silicon Mountain with confidence knowing that all their products are backed by a 100% money back guarantee. Click link to go there now!